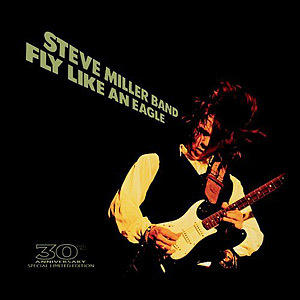 "Fly Like an Eagle: 30th Anniversary Edition"
FOR those of you who enjoyed the Steve Miller Band's closing set at the Diamond Head Crater Celebration 3 1/2 months ago, you can relive it with this special anniversary CD/DVD edition of the album that made Miller a crossover success. The DVD not only has the original album remixed for 5.1 surround sound, but also includes a documentary filmed at Miller's spacious home located in Idaho's Sun Valley mountain area. The good-natured Miller relates to Joel Selvin (veteran music writer with the San Francisco Chronicle) his own musical history, as well as the lengthy making of "Fly Like an Eagle." A special concert captured, by chance, on video from Sept. 2005 in Mountain View, Calif., rounds out the DVD. Miller has always thrived in the spirit of musical camaraderie, as he surrounds himself with his ace backing band of guitarist Kenny Lee Lewis, keyboardist Joseph Wooten, harmonica player Norton Buffalo, drummer Gordy Knudtson and bassist Bill Petersen. Featured guests at the concert include violinist Carlos Reyes and guitar slingers George Thorogood and Joe Satriani. Buoyed by the presence of so many Bay Area fans in attendance, Miller and company were in particularly fine form that night. Highlights of the two hour-plus event include Reyes' guest spots on "Abracadabra" and a subdued cover of Nat King Cole's "Nature Boy," featuring Reyes on Paraguayan harp, Nola Gasser on jazz piano and a fine, sensitive vocal by Miller. Thorogood hams it up on "Gangster of Love" and Satriani pulls out his technical chops on a spirited soloing duet with Knudtson during a cover of the Robert Johnson (via Eric Clapton) classic "Crossroads." The band stretches out their set's jamming piece, coincidentally the title track of this anniversary reissue. "Fly Like an Eagle" and the rest of the studio album has been remastered, and the CD includes three demos made during recording sessions. The special thing about Miller's music is that it's so well-crafted. That's why hit singles of the day like "Take the Money and Run" and "Rock'n Me" still sound fresh and infectious, despite being classic rock radio staples. And with its spacy Roland synthesizer intro, and pushed along by Jachym Young's Hammond B3 organ riffs, "Fly Like an Eagle" still soars into the stratosphere. "Time keeps on slippin', slippin', slippin' into the future ... "